I had quite an action-packed couple of days this weekend, which seems to be the story of our summer. After quite a bit of travel since mid-June, the last few weeks seemed to quiet down a lot, at least for me (my daughter continues to wander all over the East Coast with her grandparents). But I fell into a normal pattern of work, wrapped around a lot of time as a solo act. The melancholy tends to overpower me at times when I'm alone, and this time was no exception. I battle with depression, and there are many days when it's difficult to even get out of bed, or get off the couch. That's when I force myself to do things, as much as I don't want to. So, this weekend, I was intentional about getting out of the house. I am fortunate to have a dear friend ("Zippy") who cares about me enough to put up with my "melancholicness," and we lean on each other for advice and sincere mutual support. She invited me to her house on Friday to see her basement, which she is renovating into an apartment. This woman is more talented than many contractors, and the work she is doing is very impressive. Not only did she do all of the framing, she took a jackhammer to her concrete floor to put in a drain for a full bathroom, and she is installing cabinets and appliances for a full kitchen, too. I'm blown away by her talent with this stuff. And she's licensed, too. 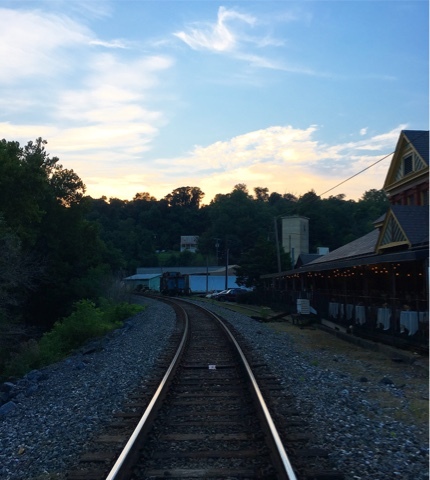 Anyway, after the tour of her home, we went to dinner at Beck's in Sykesville, which was delicious, then we walked around Main Street of this quaint little town, right on the border of Howard and Carroll Counties. It was a warm, beautiful summer evening, and I'm so thankful for my wonderful friend. Zippy is the epitome of confidant, best pal, kindred spirit, buddy, homegirl, and best friend, all rolled into one. She's the type of person who you wouldn't mind being stuck with on a little boat in a big ocean, which is what life feels like at times. I'm thankful that God brought her into my life. Saturday morning, Faithful Pup Scout woke me up at 6:30 am, and since I was up, I decided to take a little road trip. 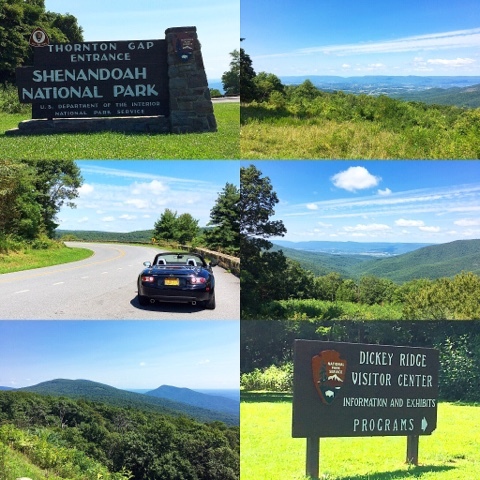 My goal was to run my little car, my 2007 Mazda MX-5, which I seldom drive anymore, and head into the mountains of West Virginia. It promised to be a beautiful day, and running the two-seater with the top dropped seemed like a sure-fire way to break me out of my mood. I left the house at about 7:30, and I made a stop for breakfast at my favorite local Chick-Fil-A on Johns Hopkins Road near Maple Lawn. The people who work there are so friendly and full of energy. Anyway, after loading up on coffee, I headed down US 29 to the Capital Beltway, headed west to I-66 in Virginia, and came to a crawl as the typical northern Virginia traffic reared its ugly head. It cleared a bit as I bypassed Warrenton, and, thinking on the fly, I decided to alter my plan. I was skirting through Front Royal and decided a drive down Skyline Drive might be in the cards. I needed to fill the gas tank, and not finding my brand of gas, I kept going west and south on US 340, thinking there would be a gas station right around the corner. I don't know why I didn't just head back to Front Royal, but before I knew it, I was two-thirds of the way to Luray. I gassed up and re-thought my plans. I decided to enter Skyline Drive at Thornton Gap, near Luray, instead, and drive north back to Front Royal. This worked well for me since, as I moved up the road soaking in the ambience (and the sun), there were many more cars heading south than going north. I had much of the road to myself. I stopped at the Visitor Center at Dickey Ridge for a nice break, then continued into Front Royal. Once there, I found a deli for a sandwich, and I got some much-needed sunblock. I then continued my love-hate relationship with my GPS. As a cartographer and avid map-reader, I prefer an atlas that I can hold in my hands to my GPS, though I understand the benefits of the technology, and it has helped me out of jams often, particularly in unfamiliar cities. I knew I should start driving back towards home, but I didn't want to go the same way I came, meaning I wanted to avoid all of northern Virginia in the DC Metro area, particularly the traffic. So I plugged into my GPS on my iPhone and figured out a possible route. I was already a few exits east of Front Royal, and the GPS pointed me north towards Brunswick, MD, which would allow me to miss the bottleneck around Harpers Ferry, WV, too, and I could head north to Frederick, then east on I-70 back to Howard County. What I didn't realize was just how many back roads I was about to encounter. I ended up on little Route 713 in the middle of nowhere, followed by Route 611, then 287, which took me into areas of Virginia I would never plan to drive through, and likely never see again. I was soon back in Maryland and on my way towards Frederick. Then I got a text from my daughter. I knew it was from her because it popped up on the screen of my phone, which was mounted hands-free on my dashboard. I decided to call her so I didn't have to stop to text. She wanted to know if I wanted to have dinner with her and my mother-in-law, but I instead invited them to join me at church Saturday night. They agreed. I rushed home and grabbed a shower. I also realized just how sunburned I got before I applied my sunblock. Fortunately, it was confined to my forearms. My hat had saved my scalp and face. And then I had a wonderful evening with my daughter and her grandmother, with a typically great Saturday night service at Grace Community Church, my home church in Fulton, MD, where we heard a fantastic first message by our new Small-groups Pastor, Seth Rumsey. 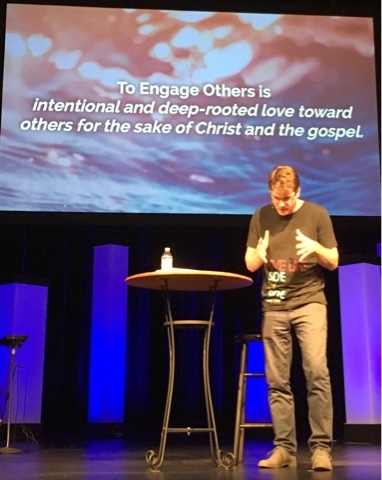 Pastor Seth challenged us to engage with other people, not only within Grace Community, but also in other areas of our lives, particularly on the heels of the terrible violence brought about by a hate group in Charlottesville, VA, last week. Following church, dinner was at the relatively new Steelfire Kitchen and Bar, in Maple Lawn. What a great couple of days! While today, Sunday, was spent resting and running errands, tomorrow brings a different kind of adventure. I get to put the Engaging Others message to the test with an event that takes me out of my comfort zone. I'm an introvert down to my core, and meeting with strangers, even if I've engaged with some of them in cyberspace, is very hard for me. But the community of Howard County bloggers has a gathering tomorrow evening hosted by Bare Bones Grill and Brewery. I haven't been to Bare Bones in many years, not since my wonderful wife, Teresa, was teaching at Mt. Hebron High School. She loved that place, and had many lunches there back in the late 90s and early 00s. So I'm going, and looking forward to it as much as I'm dreading the social aspects. All that said, I'm truly thankful for the fantastic weekend. My faith continues to be my rock and foundation, and Jesus my Lord and Savior. And it's through Him that I'm able to do the things that I do. Maybe I will see you tomorrow. I'm an introvert, too, so I don't know how long I'll last!